The attention received and the impact achieved, in such short time, by the Nu Deco Ensemble, a Miami-based collective billed as a 21st century chamber orchestra, suggests not only great musical quality but smart thinking and auspicious timing. It was only fitting that a reading by author Salman Rushdie of his latest book, “Two Years, Eight Months and Twenty-Eight Nights,” a novel whose central character is a genie named Lightning Princess, was preceded by a sudden South Florida tropical storm that included pouring rain, thunder and, of course, lightning. The book in hand, why stop magic realism at the page’s edge? 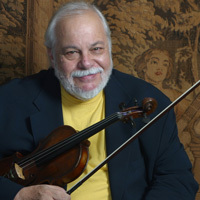 Uruguayan violinist Federico Britos, 76, speaks softly and unhurriedly. In the age of 140 characters and flash stories, his answers unfold full of real characters, unexpected details, and tempting side trips. Because he might be South Florida’s most unassuming music star, the unsuspecting listener might take a couple of beats to realize that, yes, he just mentioned in passing that he recorded with Astor Piazzolla and Charlie Haden; that as a youngster, he got to hang out at jam sessions in Montevideo with Louis Armstrong, Duke Ellington, and Benny Goodman or; while recalling his days living in Cuba, how he played and recorded with major artists such as Orestes Urfé, Chucho Valdés, Bola de Nieve, and Elena Burke.